José Francisco Rivas Valencia owns a land development company in Colima, Mexico. He lives 7,600 miles from Greg King, a GIS consultant based in Brisbane, Australia. Yet Rivas and King meet once a week in an online virtual classroom—sometimes as computer avatars—as they pursue a Master of Professional Studies in Geodesign degree from a school located thousands of miles away from both men: the Penn State World Campus, based in State College, Pennsylvania. Penn State has designed a program that takes advantage of online education, which is being increasingly embraced by universities today. Geodesign student Greg King of Australia shares his home computer screen to show his design proposals to classmates and guest critics, all of whom assemble virtually in an avatar-based meeting space. The students and faculty use Skype, Yammer, and 3D immersive collaboration software like Terf to communicate and collaborate on joint class assignments or review each other's work. They created avatars that bear a remarkable resemblance to their real selves, appearing last spring in a 3D classroom to present their final transit-oriented development (TOD) projects for faculty member Michael Flaxman's course, Geodesign Studio I: Rural/Regional Challenges. 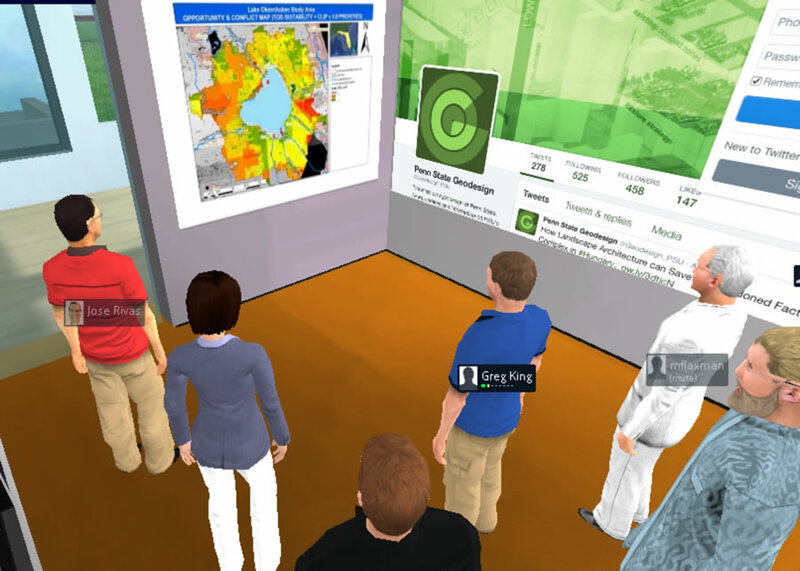 The avatars clapped after each presentation, and the students listened to feedback from their instructors. Shannon McElvaney, a student based in California who works for Esri, commented that he enjoyed getting together with the other students. "I liked going through a studio approach and the conversations. I think I have learned as much from the conversations as from the class itself," he said. Though Rivas has had some Internet bandwidth issues—including when trying to use the avatars—King said he thought the avatars brought a sense of realism into the classroom. "I think the avatars are great," said King. "[It's] almost like actually being in a discussion with someone personally." Penn State's online geodesign education program was designed for the working professional, and Rivas and King both fit the bill big-time. Each man keeps a busy schedule and sought out an online master's degree program in geodesign rather than, for example—as in King's case—take an individual, elective geodesign course at a nearby college as part of another type of degree. "Without Penn State offering geodesign as part of the World Campus, I wouldn't have the ability to study geodesign," King said. Penn State's program offers a golden opportunity to learn a planning and design methodology that takes into account the design proposal area's environment, factors such as social and economic sustainability, and the people who live there. It also adds spatial analysis into the equation. 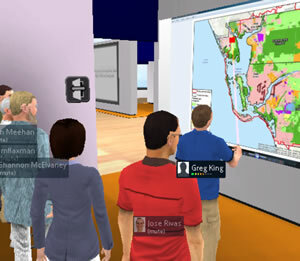 An avatar representing Michael Flaxman (in the white suit), a geodesign faculty member at Penn State, views a geodesign project with other student and faculty avatars in the virtual classroom. The avatars for José Rivas and Greg King are pictured. King said he learned a design principle long ago that stressed that the design of an entity can't occur in isolation. "As every building/entity/community interacts with its surroundings, the design process needs to involve the surrounding areas," he said. King works for an engineering firm and said that there is always "a push [for] innovative planning and design for any project." He hopes that he will gain a better understanding of how GIS results are interpreted for design purposes. 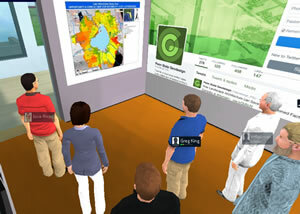 "As geodesign is a new discipline, getting involved now lets me contribute to its development. Opportunities like this are quite rare," King said. Rivas owns Ryval Constructora, a construction company in the City of Colima, which is about 62 miles inland from the Pacific Coast. His firm focuses on land development and establishes joint ventures with other companies and housing developers, which build the homes. Rivas wants to use geodesign methodology and tools to pursue sustainable land development practices in the city and the state of Colima, which is south of Puerto Vallarta. "We have a very small state and a small city but with a lot of urban challenges and opportunities due to [a] strategic location in our country," Rivas said. A geodesign methodology, said Rivas, will help his team, local officials, consultants, would-be clients, and the people who live nearby do better at collaborating. The result will be social, environmental, and economic sustainability, he said. "Of course, as a company owner, I look forward to profits," said Rivas. "But I am also aware of social responsibility, and I am sure that if the planning and design process of my developments undergo a collaborative process . . . the final product will be highly profitable, not just for my company but also for the community and the whole city."